The BFD version of “Nick Mason Drums” is a digital recreation of the legendary Pink Floyd drummer’s “Custom Ludwig® Black Kit” and was recorded by engineer/producer Alan Parsons who originally recorded the album “Dark Side of the Moon”. The same classic miking techniques and EMI mixing console model was used as they did in 1973 so that “Nick Mason Drums” could offer an authentic recreation of a vintage drum sound heard by millions on one of the best selling albums of all time. 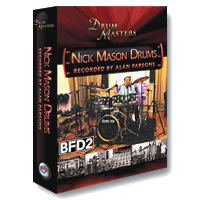 Nick Mason Drums for BFD is an expansion sound library for FXPansion’s BFD2 and BFD3 software which allows discrete multi-channel drum kits to be played from any midi keyboard or e-drum. Individual mic channels can be mixed by the user to create a variety of drum sounds from dry to ambient. The drums are mapped in both standard BFD formats and Sonic Reality’s advanced “iMap” layout for high performance in midi drum programming and live playing. Coming in at close to 5 gigabytes in size this high quality drum kit from Mason and Parsons offers top “album quality” sound. In addition to the digital recreation of Nick’s drum kit, live drum grooves were also performed by Nick Mason and recorded by Alan Parsons for upcoming loop libraries and more from Sonic Reality. Other formats such as Reason, SampleTank, Kontakt, Rex, Apple Loops, Acidized Wave and Stylus RMX are coming soon from http://www.esoundz.com and select Sonic Reality dealers and distributors worldwide.